The Rage Blaster (リベンジシューター, Revenge Shooter) is an item in Super Smash Bros. Ultimate original to the Smash series. 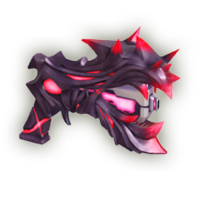 The Rage Blaster appears to be a normal Ray Gun that has been corrupted by some dark mass. The Rage Blaster fires large plasma projectiles straight ahead. The projectiles become stronger the higher the user's damage is. The gun itself can be used as an thrown projectile, even when the gun isn’t fully depleted. Equipping the Strangelove, Dark Man 4 or Gangster, Lady & Policeman Support Spirits will give the player a Rage Blaster at a start of a match. The Rage Blaster resembles the Dark Cannon, as well as Dharkon's tentacles. The Rage Blaster is seemingly named after the hidden mechanic in Smash 4 known as rage, given its ability to deal more damage when its user has higher damage. This page was last edited on April 8, 2019, at 12:57.